Knowingly set in the American southwest in the summer of 2015 (when the New Horizons space probe was swiftly approaching the orbit of Pluto), the narrative hops from one time period and location to another, following three characters on very different (and yet directly related) journeys. Kiernan tells their stories with equal amounts of lucidity and pathos, yet each with a distinctive voice and style. Fans of classic weird fiction author H. P. Lovecraft will be pleased to know that this novella is something of a meditation upon his classic 1931 short story “The Whisperer In Darkness,” in which a man pieces together evidence of a terrifying alien conspiracy at work in rural Vermont, and which also has a lot to do with the then-newly-discovered Pluto. In something of a nod to espionage fiction, an aging government operative referred to only as the Signalman meets with a strange and mysterious woman, Immacolata Sexton. Their discussion is candid and abstract; it’s a bit like listening in on strangers; only very gradually does the nature of their conversation get revealed—yet even there, it illustrates only a few fractured pieces of a much larger (and darker) picture. A couple of weeks before, a young woman named Chloe describes her time spent with Drew Standish, a sort of cult leader who is collecting lost and easily manipulated members to become the Children of the Next Level. Chloe’s narrative is often hazy and digressive, but it paints a frightful picture nonetheless. And then there is Immacolata Sexton herself, whom may exist (or follow a perception) somewhere outside of time and space, hopping from one time period and location to another, from decades of curious discovery nearly a century ago and into frightful decades yet to come. What she observes, discovers, catalogues, and cultivates in these shifts are perhaps the most disturbing hints of all in this tight, twisted novella. 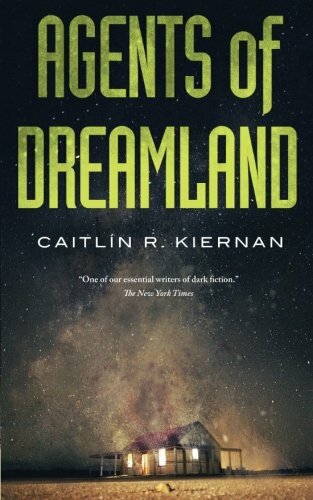 There are certain scenes in Agents of Dreamland, which are reminiscent of other works by Kiernan; specifically, her novella Black Helicopters (2013, Subterranean Press) and story “Black Ships Seen South of Heaven” (printed in Black Wings of Cthulhu IV, edited by S. T. Joshi, Titan Books, 2016). Like those other works, these scenes hint at the carnivorous cosmic doom that is slowly encroaching upon our world, and make for some of the darkest and most disturbing imagery this side of a post-apocalyptic tale. It’s a bit hard to comprehend the amount of story that is told in a little over 120 pages; this owes largely to the novella’s jigsaw puzzle-like narrative structure. Agents of Dreamland is an exquisitely haunting read, full of mesmerizing prose, unsettling images, and profoundly disturbing implications. And after reading this novella, one may never view that dwarf planet at the edge of our solar system the same way again.